Introducing the newest addition to Fentimans botanically brewed drinks collection; Sparkling Lime and Jasmine. You'll probably recognise Fentiman's from the likes of classic Victorian Lemonade, Curiosity Cola and Dandelion and Burdock. A lover of all things vintage, their traditional British branding and flavours are something I'm instantly drawn to. Established in 1905, I love that Fentimans bring timeless tonics, craft beers and additive-free soft drinks to the present day. In their iconic glass bottle and with the same quintessential lettering, this new addition to family has a real modern twist. Lime and jasmine flavours to me spark images of Far East; the likes of kaffir lime, Jasmine infusions, green tea and exotic plants come to mind. Botanicals are something I associate with gin too, since it's also brewed botanically. With that, I've created an Eastern inspired twist on a classic gin cocktail, the Tom Collins. This recipe mixes Fentimans Lime & Jasmine with lime juice, sugar syrup and good quality gin to create a Lime & Jasmine Collins, if you will. Serve over ice and garnish with lime for a refreshing cocktail which complements the floral, refreshing and slightly bitter Fentimans flavour. sausage, spinach, mozzarella and egg pan bake with debbie∧rew's. A Mother's Day breakfast treat for that special person in your life. With this Sunday 6th March just around the corner (note: remember to put that card on your shopping list), I've teamed up with debbie&andrew's to create a breakfast recipe to make her smile. This one pan wonder is so simple to rustle up and can even be made with leftovers. Inspired by Andy Bates' sausage, spinach and egg bake, I've made a version which switches mushrooms for red peppers and cheddar for mozzarella. Of course don't forget fresh flowers and a cuppa just the way they like it. Fresh flavours, convenience and value for money. If I can combine the three without compromising on a colourful and healthy dish, I'm happy. Luckily my freezer is my best friend for this kind of thing; packed with king prawns, salmon portions, frozen vegetables and vegetarian sausages. I'll often buy a whole salmon side, slice it up into fillets and have ready in the freezer to cook up with my favourite sauces and fresh vegetables. In collaborating with Iceland on their #PowerofFrozen campaign, I've got a few more exciting things in my freezer drawers of late. Think extra large Arctic scallops, Canadian lobster tails and even French crème brûlées. Iceland are encouraging more people to embrace all things frozen - because naturally freezing the likes of seafood, unusual meats and superfood greens can lock in the flavour and nutrition of ingredients. Yep that's right, Iceland now do frozen kale - it isn't all fish fingers afterall. A super simple vegetarian recipe, which features pan fried gnocchi stirred though with rich pesto, sweet tomatoes and a kick of chilli. Ready in under 30 minutes, this one pot veggie delight won't leave you standing over the washing up bowl for long either. Scatter with fresh parsley and vegetarian cheese, then just simply serve up for everyone to help themselves! Step one. Begin by adding a little oil to a large frying pan and frying off the gnocchi for 5-8 minutes on a medium heat. Step two. Add in the tomato halves, puree and chillies and cook through for a further 10 minutes. Add a little boiling water if the gnocchi starts to stick. Step three. Stir through the pesto and cook for 5 minutes until heated through and the tomatoes have softened. I used the Sacla Tomato & Olive Intenso Stir In - which is veggie friendly and has some chunky olives in too. Season to taste and serve up with parsley and your favourite cheese! Or a few vegetarian recipes from my recipe archive! Meatcure is one of the newer establishments of the brilliant burger restaurants that have come to Leicester. With a well received Market Harborough location, you can imagine the local chatter around the new indie eatery. A few month since the launch back in September, I returned to try the latest burger specials and their famous hardshakes. Nottingham based Hart's is a 4 star boutique hotel and restaurant found along Park Row. Just a short ten minute walk from the city centre, Hart's hotel was designed by architect Julian Marsh and built on the former walls of Nottingham’s medieval castle. The design is contemporary with modern art throughout, although the grounds have a more rural feel which make you feel far away from the busy city centre. I went along to experience on of their Superior Rooms as well as dine in the nearby 80 seater restaurant. With 2016 seeing in the Chinese New Year of the Fire Monkey, what better time to be inspired by some delicious and super simple Chinese recipes. I especially love making Oriental inspired appetisers, and since I learnt how easy it is to make your own wonton pastry at home I've loved creating new flavours, fillings and shapes. Featuring Blue Dragon light soy sauce, I've created some crispy king prawn and salmon wontons that go perfectly with a squeeze of lime and their sweet chilli dipping sauce. Serve as a sociable starter at a Chinese dinner party - ideal to make ahead and fry off when you're ready to indulge! With Easter eggs and tempting chocolate treats lining the shelves, it can only mean one thing. Time for Creme Egg recipes galore! From beautiful baking to sweet treats, every year I love to see what Cadbury Creme Egg recipe will come up next. This year I've continued the gloriously chocolately Easter theme with these easy-to-make Creme Egg meringue nests. These would be fun to make with children, although an equally adorable make-ahead dessert for any Easter guests. Once you've melted your chocolate and dyed it in the signature egg-yellow shade, all your really have to do is pipe away along the meringues, fill with an indulgent chocolate whipped cream and top with half a Creme Egg. You could have lots of fun decorating the meringues in all kinds of colours - the more messy and creative the better in my opinion! Enjoy! 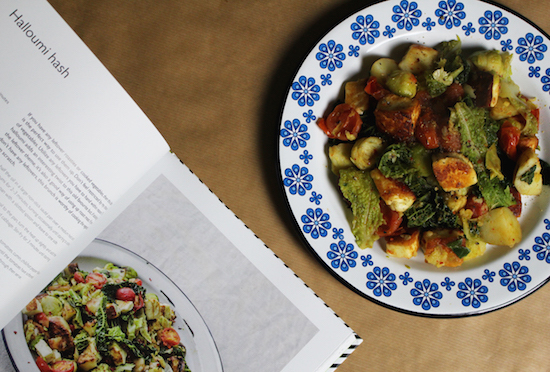 the part time vegetarian by nicola graimes: a recipe book review. The Part Time Vegetarian by Nicola Graimes (RRP £20.00) is, as the name suggests, a collection of vegetarian and almost vegetarian recipes. The author, who spent almost thirty years of her life as a vegetarian, admits how more recently she has found herself introducing a small amount of fish and meat into her diet. A lifestyle known as flexitarian, whereby although not completely meat-free is made up of informed choices around sustainability, health, welfare and seasonality. Reverting to non-vegetarianism may come as a shock, and possibly a disappointment to the passionate veggies of the world. Actually if you look at it the other way, the book provides brilliant inspiration for vegetarian recipes for someone like me who does eat seafood and meat on occasion. I've was veggie for almost ten years through my childhood and often dine out without even realising that I've picked the meat-free option. So as someone who eats veggie meals around five times a week, frankly this book is right up my street. Happy Chinese New Year - 2016 the Year of the Monkey! I love creating Chinese inspired recipes and this one is no different. It actually came about by accident when I only had one salmon fillet and wanted to make it stretch into a noodle dish to use some stir fry veg, mushrooms, coriander and spring onions. 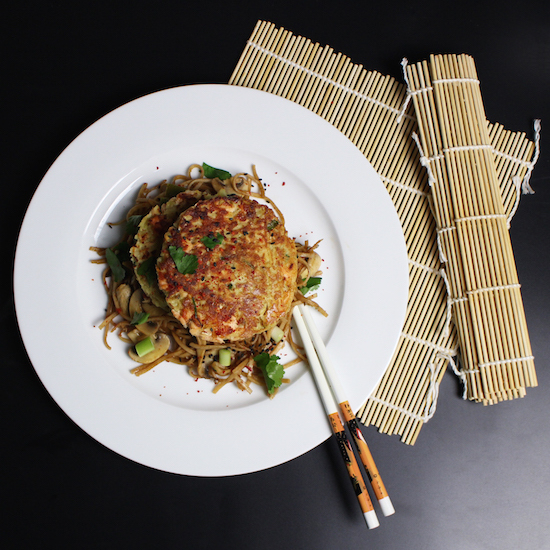 To make the salmon work for two meals, I used a large potato to make some delicious Chinese style salmon rostis to go with vegetable noodles. Can you believe one salmon fillet yielded four rostis? A recipe I'll make again and again for sure. colwick hall hotel & byron's brasserie, nottingham. Colwick Hall Hotel is a Nottinghamshire hotel and events venue which dates back to the 11th Century. Inherited by the family of Lord Byron in the 1300s and 1400s, Colwick Hall has plenty of history and character to share. In the last 50 years it has undergone a massive restoration which has seen the beautiful features come back to life, to be enjoyed as a wedding venue, brasserie restaurant and a place for relaxed getaways. Being right next to the Nottingham racecourse, it would be perfect stopover for racing events too. My mum and I went along to experience their latest menu, as well as stay in one of their old but charming guest rooms. 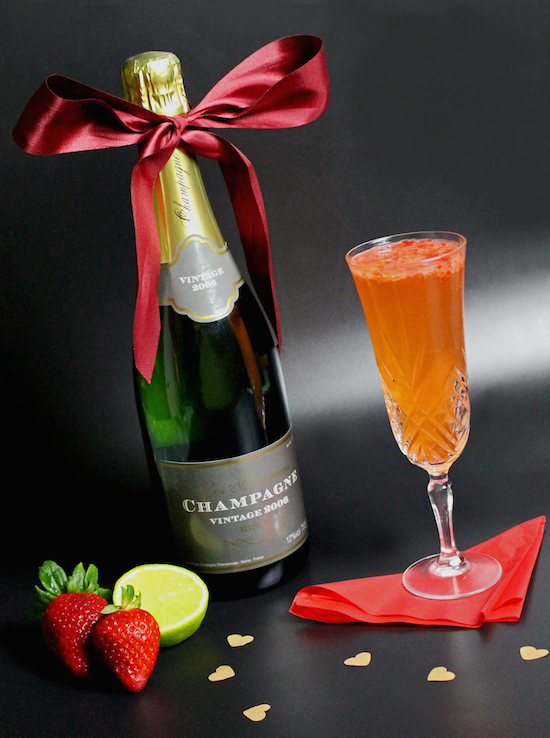 A Champagne cocktail especially for February 14th! Whether you're spending it with your girl gang or with that special person in your life, this strawberry and lime bellini cocktail is fruity, fizzy, refreshing and super easy to rustle up! I've collaborated with Central England Co-op with this loved up Valentine's cocktail recipe, featuring their award winning Les Pionniers Champagne which retails at £24.99. Strawberry, lime and fizz? I don't know about you but I'm in love!